Following on from our post on designing a tattoo for a character, here’s a look at the various ways to apply temporary tattoos for a film or television production and some of the makeup products used. Stencils are made from a thin, durable plastic which is reusable and easy to clean. The tattoo design is cut into the plastic, leaving holes for the makeup to go through. Some stencils come with a cosmetic-grade adhesive on the back which sticks the stencil to the skin, leaving both hands free to apply makeup. The adhesive lasts for a few applications. Other stencils don’t have an adhesive backing, but you can get spray-on adhesive (e.g. Temptu Stencil Tac) that is easy to clean off after every use. Medical tape can also be used around the edge of the stencil to secure it to the skin. Stencils can be used either way round. Ready-made transfers come in a variety of designs, colours and sizes. Some transfers are in full colour, others are just in black, which can be left as is or coloured in freehand with tattoo makeup colours. Transfers can be bought individually and some come in packs of similar designs or theme. Only use professional tattoos designed for use on skin, as unregulated products can be made from toxic dyes that cause reactions like blistering and rashes. Transfer paper is a specialist paper that can be used in most printers, allowing the freedom to print any design and to have spares ready printed for use later. Normally A4 in size, it consists of several layers e.g one for the printed design to go on, a paper backing and a glue sheet with the adhesive. Remember to print designs mirror image so that the design is the required way round on the skin! Professional makeup products to create tattoos have a high pigment content, come in the colours used in real tattoos, are designed to last and withstand various conditions, like heat, sweat and water. Tattoo makeup come as solid dry colours (activated by alcohol), liquid colours (ready to use) and as tattoo pens. Dry makeup: Can be bought as individual colours and in palettes. The colours are activated by IPA (isopropyl alcohol or rubbing alcohol), which also helps the tattoo to last. Products include: Skin Illustrator Horishi palette, Temptu Tattoo palette, Skin Illustrator Classic Tattoo pots, and Reel Creations Color Pots. Liquid makeup: Ready to use, the liquid products can be use in an airbrush or by hand using a brush or sponge. Liquid tattoo colours include: Temptu Dura Liquid Tattoo, Skin Illustrator Tattoo Classics and Reel Creations Body Art. 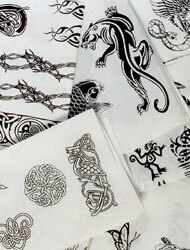 Tattoo pens: Pens are great for creating freehand tattoos, for colouring in a stencil or outlining. The pens made by KD151 come with different sized/shaped nibs, allowing for both fine work and filling in. Other tattoo pens include: Reel Creations tattoo pens. Gather all items needed to create your tattoo, set everything out and wash your hands before you start. Prep the skin: whatever method you use to create the tattoo, you must work on clean skin. Use IPA to get rid of any oil and dirt on the skin. Excessive hair can be a minor problem, so if your tattoo is going onto, say, a really hairy arm, you need to think about how you’re going to work with that. You can remove the hair and, once the tattoo is applied, lay on hair over the top. Or, if you don’t want to do that, you have to use an application method that allows you to get in and around the hair. With adhesive: Place the stencil onto clean, dry skin, and press it down gently, making sure it is completely flat to the skin. Without adhesive: Use a bit of medical tape around the outside edge of the stencil to stick it down and stop it slipping about, or use a stencil adhesive like Temptu Stencil Tac. Apply colour: Use an airbrush, sponge or brush to apply makeup through the stencil. You can also use the stencil to create an outline, then complete the colour after removing the stencil from the skin. Once the makeup is dry, carefully remove the stencil. Clean the stencil with alcohol (e.g. IPA). Cut the transfer out, as close to the edge of the design as possible. There is usually a clear protective layer over the face of the tattoo which can be pealed off just before application. Apply the transfer: Some transfers go directly onto clean dry skin; others go onto wet skin – you need to wipe the skin first with a bit of water or IPA and leave it damp. Apply transfer to skin and press down, keeping it in position to prevent the tattoo shifting. Press a wet sponge or cloth to the back of the tattoo until the backing paper peels away – and the transfer is now on the skin. If any area of the tattoo is lifted, use the damp sponge to press it down. Let the tattoo dry thoroughly. If you are super talented, or it’s a small/simple design and there are no major continuity requirements, then you can simply draw your tattoo freehand. You can also create a template with a stencil or by using tracing paper – the design can then be completed freehand. Print out the design as a mirror image. Place a piece of tracing paper over the design and carefully trace the design using a sharpened pencil. Clean the area of skin to be used with alcohol and let it dry completely before proceeding. Apply a little clear stick deodorant to the skin. This helps transfer the graphite from the pencil template. Place the tracing paper transfer face down onto the skin and press firmly, smoothing from the middle to the edges to ensure a good template is made. Remove the transfer and you should have a feint outline. Complete the design using your tattoo makeup. Tattoo looks a bit shiny: simply dust the tattoo with translucent colourless powder and let it set for a few seconds before brushing the excess powder off. Fade tattoo to make it look older: press some translucent powder into the tattoo once dry, which helps softens the tattoo, making it look slightly faded. Seal the tattoo with a sealer to help the tattoo last longer. Don’t rub or pick at the tattoo, leave it be as much as possible! If it gets wet, pat it dry. Don’t use any lotions, oils or soap on the tattoo as this will damage it and even remove it completely. You can shower, but don’t use any products on the tattoo area and pat dry afterwards. Or cover the tattoo over with a waterproof dressing or a plastic bag – stick down using medical tape. Obviously don’t use tape directly over the tattoo as the adhesive could lift the transfer. Simply rub oil (like baby oil or cooking oil) or alcohol (e.g. IPA) into the tattoo and it will break down the transfer and colours. Soap and water can also remove some tattoos. Designing a temporary tattoo for a character and where to get inspiration for designs. I would like to know if I can send them my designs and you print them. ? Of course I would still pay for them. it seems to me that they lack more designs. We are ready if you want new designs. Thank you . What are the chits made of?